Integrity constraints are general properties that a given database is expected to satisfy. Integrity constraints can be implicit in the schema of the database or explicitly expressed as, for instance, logical formulae. Since the database is expected to be consistent with respect to these properties, one important issue is the verification of integrity constraints upon updates. Such a operation is called constraints verification or constraints checking. 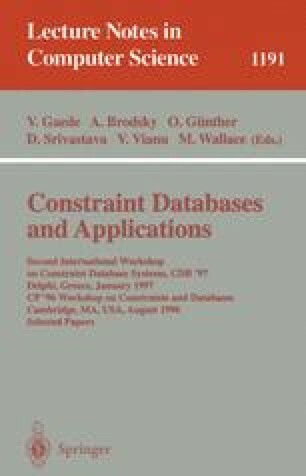 Constraint verification is potentially an expensive operation for all types of database and in particular for deductive databases , and deductive and object-oriented Databases (DOOD), where the modification of a single data can have a substantial impact on other data because of the presence of deductive rules and inheritance. Chimera is one instance of a DOOD data model and language. It has been developed in the context of the ESPRIT project 6333 IDEA. In this paper, we show how integrity constraint checking can be applied to Chimera databases. We show that integrity constraint checking in Chimera databases can be reduced to integrity constraint checking for deductive databases relying on a translation of Chimera databases into Datalog rules, extended with stratified negation, records, sets and arithmetic and set comparisons. Finally, we take advantage of our observation to present the application of one specific deductive method for integrity constraint checking to Chimera databases.